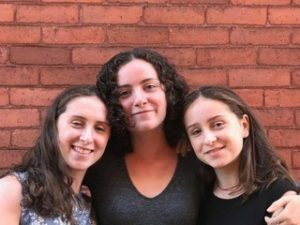 Hannah, Sophie & Cece Weider are trying to make youth homelessness a thing of the past in Ottawa. The three sisters, shining examples of the fact that age is no barrier to making a difference, were shocked to meet a young homeless person outside of their local grocery store six years ago, and to learn that over one thousand kids have no home to turn to in the city. Dismayed that the capital of a first world country still sees kids living on the streets, the sisters decided to sleep outside of City Hall – in the dead of winter – to raise awareness of the problem, and to highlight the work of the Youth Services Bureau in trying to end youth homelessness. We have lived in Ottawa our whole lives, so it is hard to compare. But in talking with friends and family who live elsewhere, it is clear that there is something special about Ottawa. As the nation’s capital, Ottawa embodies – and celebrates – what it is to be Canadian. It is home to our national institutions and has a sense of a patriotic, bilingual, multicultural community. At the same time it is made up of unique, tightly knit neighbourhoods where the sense of local community has the strength and atmosphere of small towns. We love that Ottawa is a place where even kids can bring about positive change. There are tons of opportunities to get involved and make a difference in your community and supportive community leaders willing to help. The most amazing people have supported us time and again – people like MP Catherine McKenna, MPP Yasir Naqvi, Mayor Jim Watson, our City Counsellors, the staff at the Glebe Community Centre, our teacher and principals, and – of course – our parents! That is something we love about Ottawa – that so many leaders are willing to help out and so many people share a desire to make our city, and our country, a better place for everyone. Even though we are super fans of Ottawa, no city is perfect. There are more than 1000 homeless youth in Ottawa every year. People generally believe that there are enough safe beds and resources for all our homeless youth, but this is far from the truth – organizations around the city struggle to provide enough rooms for our homeless youth every year. In a country as great as Canada, especially in the Nation’s capital city, no youth – no person – should be without a safe, warm place to sleep and the food, clothing, medical help they need. This is why we have been actively involved with the Youth Services Bureau for the past five years – so that we can help put an end to youth homelessness in Ottawa. Six years ago we had an encounter with a homeless youth outside our neighbourhood grocery store. This was a shock… Our family wanted to do something about it. That year, in February, we slept outside at city hall to raise awareness for homeless youth in our city and to spread word that the Youth Services Bureau (YSB) was there to help. After speaking at our schools, reaching out to friends and approaching organizations like the Glebe Community Centre, we saw that many people wanted to help out – and the annual YSB SleepOut for Youth was born! The next year the number of participants doubled. And the next year it did the same. And every year we were surprised to see the amazing support from out city – every one wanted to help, they just didn’t know how to before. This year we had over 750 participants – over half of them youth – on the TD Place field at Lansdowne (we had outgrown city hall last year). We raised over $250,000, bringing us close to a million dollars raised in support of youth homelessness shelters in the past five years! We’d be the first to tell you that this isn’t our doing – it’s just an amazing example of the Ottawa ripple effect at work! We are so grateful and proud of everyone who has participated, supported and helped organize the event year after year. Together we are making a difference! Five years ago we dreamed of a future that had supportive housing rooms for every homeless and at-risk youth in Ottawa. Today we see this future coming true with YSB breaking ground on a new emergency shelter and mental health centre that will hopefully provide enough supportive housing for youth homelessness in Ottawa to be a thing of the past. We hope that this is just a first step towards a future Ottawa being a place where no person, of any age, is living on the streets. We also hope that more people realize the power they have to create meaningful and positive change – they’re living in the easiest place to do it!